I wanted to find a way that I would enjoy fennel in it’s raw state. 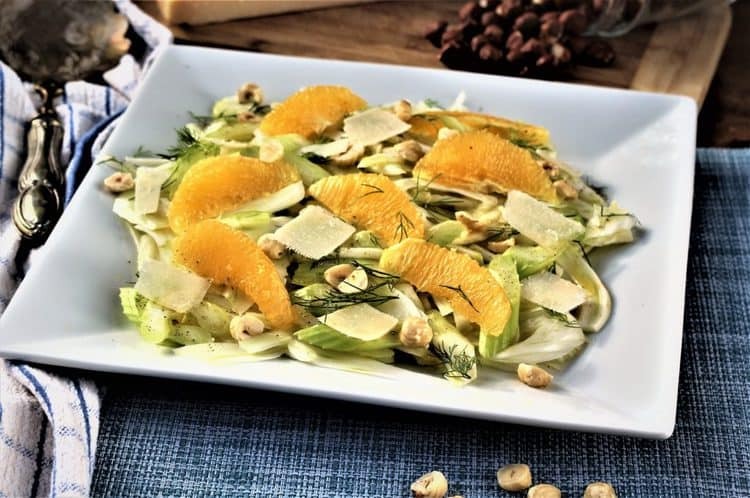 I came across several Sicilian fennel and orange salads that looked interesting, and that’s how I came up with my take on this salad. Last weekend I was searching through the fridge looking for a lunch idea. With this dreary, cold and grey winter we’ve been experiencing thus far, I was suddenly craving a salad, something other than the usual boring lettuce. So I pulled out the fennel, an orange and some celery. All items I already had in the fridge. I used a mandolin to slice the fennel as thin as possible. 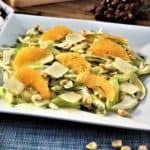 To give my salad a bright, zesty flavor I decided to incorporate the juice from the orange I supremed as well as a touch of honey to sweeten it. I then decided the salad needed some protein so I added a handful of toasted nuts that I always have available in my pantry, on that particular day I had pecans. Today I had lots of hazelnuts so I used those instead. Basically, any toasted nuts will do. Finally, I topped the salad with parmesan shavings to give the whole thing a nice contrasting salty flavor. Let me tell you how much that salad brightened up my day! First of all, just look at the vibrant colors. And then the flavors and textures are amazing. 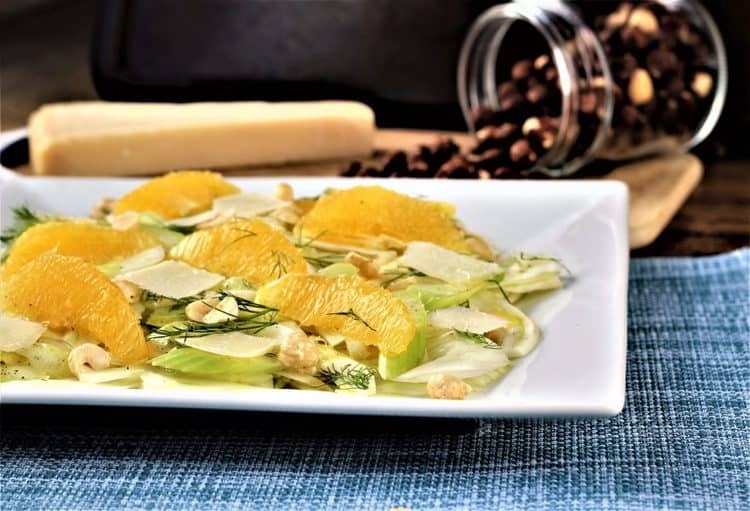 Just imagine the fresh, juicy orange slices, the saltiness of the parmesan, the crisp fennel and celery all bathed in a bright citrusy dressing. It was refreshing! But don’t just imagine it, try it for yourself! I know I’ll be making lots more of this salad before this winter is over. Don’t forget to tag me on Instagram with your salad if you make it. 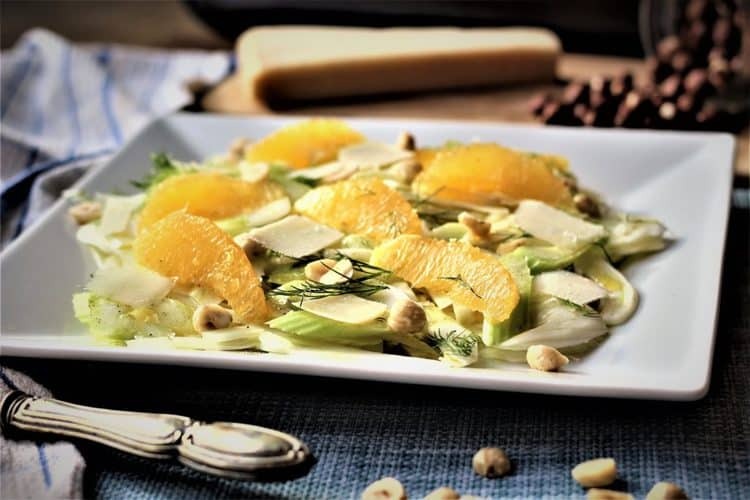 Sicilian Style Fennel, Celery and Orange Salad with Hazelnuts is the perfect winter pick-me-up salad with it's bright citrusy flavors and contrast of textures. Cut the stems off the fennel, reserving the fronds for garnishing the salad. Cut the fennel in half, remove the core and cut into quarters. Using a mandoline, thinly slice the fennel pieces. Place into a bowl. Using a knife, thinly slice the celery at a diagonal and add to the bowl. Using a sharp pairing knife cut the orange into supremes and add to the bowl. Squeeze the orange juice from the core of the orange into a small bowl. Stir in the honey, olive oil, red wine vinegar, salt and pepper. Pour the dressing over the vegetables and orange and toss to combine. To serve, garnish with fennel fronds and parmesan shavings. Serve cold. Thank you Rosa for your feedback, always appreciated!